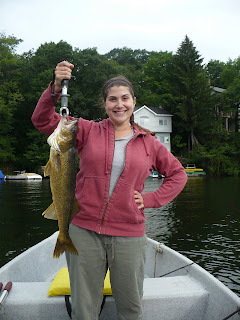 Although Lindsay caught this beautiful Walleye, I consider it a personal success. I took all of the great info that I had been given about this lake, and used it. We fished just like I had been told, soley with live herring on slip-bobbers, a live-line and a down-rod, and I was able to net this gorgeous fish after Lindsay fought it. It was released back to the lake. After not getting a bite off the Hopatcong Yacht Club or Henderson Bay, I thought it was going to be a dismal day. However, after setting both anchors again in the back of Byram, we had some action. I missed a couple bites, but Lindsay caught a couple fish. Seeing this Walleye come into the boat certainly gave me some confidence and I am looking forward to many great catches like this on what is now officially my favorite lake in New Jersey.